I’m sure those contests can get you some recognition on the ‘gram, but can they guarantee an influx of new followers? I mean, maybe a handful of people that were super impressed with your competitive eating skills but move along hotdog eating contest — Instagram contests are the new thing in town. 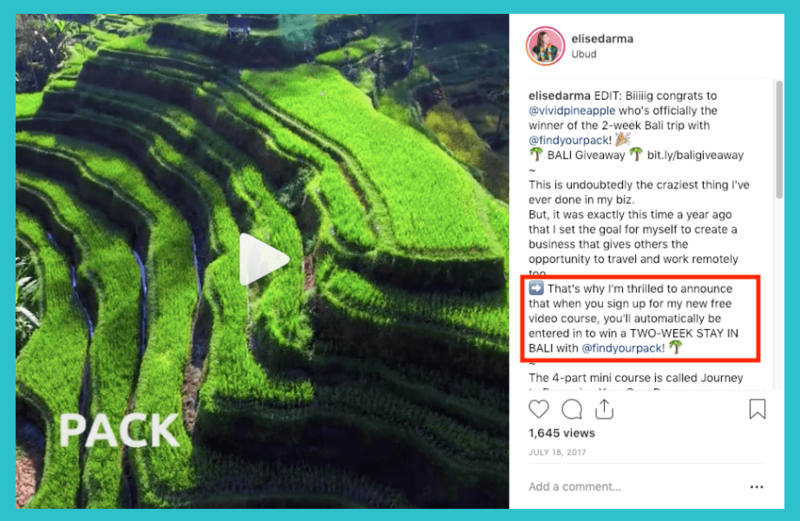 Running a contest on Instagram brings in new followers and brings recognition to your brand with one single Instagram post. I’m serious. One post can bring a whole new wave of followers (I’m talking 500+) when done correctly and strategically. Looking for a guaranteed way to boost your followers with just one post? Look no further than running an Instagram contest. Keep on reading for all the reasons you should run a contest, the types of Instagram contests and the recipe to running a successful follower-boosting Instagram contest! You’ve seen them on your own Instagram feed, you’ve entered a few (especially the one for that automatic cat feeder for your favorite four-legged pal) and you’ve been tagged in them by friends — but should you run your own? Say it with me: visibility. As a biz owner, it’s what we want. It’s what we need. Looking for a quick and easy way to get your name out there? Run an Instagram contest. People love winning free stuff. Your followers will tag their friends, old teachers, neighbors, hair stylists and babysitters in order to have a chance to win your contest. The ultimate domino effect — next thing you know, entire social circles are made aware of your brand because of a notification on their phone, triggered by a friend tagging them in your contest post. The tagged friend’s interest has now been sparked. They want to enter the contest — so they begin sharing and tagging other friends on the contest post to increase their own chances to win free stuff. Instagram contests will cause your notifications to blow up, so prepare yourself. With a contest comes a wave of double-taps and a flood of comments. A tsunami of engagement, if you will. Fabletics is a huge fan of running contests on their Instagram, and we can see why based on just the extra spike in engagement on their contest posts! They’ve built up just shy of 1M followers, too. The increase in engagement on your post will cause the Instagram algorithm to give your post extra love by showing the post to more people which in turn means more contest entries, more followers and more brand awareness. Ooooh yeah, just ride this engagement wave! Increase your follower count by running an Instagram contest that requires everyone to be following your account in order to be eligible to win. Take it a step further and partner with a brand or influencer, and cross-post the contest which now opens both you and the brand/influencer to a new audience! It all goes back to wanting the free stuff. They’ll do what’s required! Set up a contest prize they can’t refuse and watch your follower count rise. So many new friends! The most basic of the Instagram contests: simply have your followers “double-tap” on the contest post to enter themselves into the contest. This method ensures that all your followers have a fair shot as it guarantees one entry per person! Have your followers comment on the post to enter your contest. Maybe it’s a “photo captioning” contest and the best caption wins! Or you want your followers to comment their favorite emoji to enter the contest; the options are endless! Here’s an example of how Simon & Schuster ran an Instagram comment contest to promote a book! Be sure to limit your followers to only one comment per account or specify entries can be unlimited! A very popular Instagram contest method and the best way to increase your brand awareness — have your existing followers “tag a friend” to enter the contest. From there, it’s a domino effect! That tagged friend tags new friends. Those newly tagged friends tag even more friends and before you know it, their entire friend group is entering into your contest! This Instagram contest method involves your followers posting a photo on their personal Instagram. They’re able to enter the contest by tagging your account in the photo and/or using a special contest hashtag that you provide. Here’s an example of a contest that Marvel Studios ran where they asked fans to post photos of their favorite Iron Man memories on Instagram and tag them to win a trip to a movie premiere! Another example of the Instagram contest domino effect: now the followers of the accounts who participated are curious and interested, which results in visiting your account and entering your contest on their personal account. Fabletics is a big lover of the repost-to-win contest format as you can see! Similar to the photo challenge, the repost-to-win contest requires your followers to post on their personal accounts but you provide the specific image they need to repost. This specific image usually includes your branding and contest info so others can check out your account and enter the contest for themselves. Don’t forget to ask your followers to use a specific hashtag so you can see all the entries! This is a great way to spread your contest, your brand and showcase your product directly through your audience! The best way to increase followers, boost engagement and brand awareness? Using a mixture of the entry methods above PLUS requiring anyone who wants to enter the contest to follow you. Forever 21 employed a mixture of different contest strategies by asking their audience to follow them, comment AND tag 2 friends to be entered into their giveaway contest! By following, liking and tagging a friend — you’ve increased your following, boosted your engagement and increased brand awareness with that one single post. That’s the secret sauce, in my opinion. Ready to run a contest on Instagram to raise your brand awareness, boost your followers and increase your engagement? Check out your Instagram analytics to see when your audience is most active. Don’t run your contest over the weekend if those are your lowest engagement days. Pay attention to the times of year. Can you theme it as a “back to school” contest or “12 Days of Christmas” mega-giveaway campaign? Maybe you’re about to launch a new product? Create hype around the launch and raise brand awareness by running an Instagram contest! A surefire way to grow your following is to partner with a brand or influencer and run the contest together. Teamwork makes the dream work, people. For example… when I partnered with @findyourpack and offered a Bali giveaway to grow both of our followings! Be intentional when choosing which brands and influencers to partner with. Make sure that they’re aligned with your business, and that they’re a company or person whose followers will be interested in you and your biz, too. Your contest will only be as successful as what you’re offering. Give it some thought: what would your followers be interested in? If you’re running an account based on holistic nutrition, don’t make the prize a lifetime supply of synthetic whey protein powder. You get the idea. Make the prize valuable — something your followers can’t resist. Congrats! If you’ve made it this far, you’re about to be running your own Instagram contest. How should your followers enter the contest (one of the 6 methods from above)? How many times can they enter the contest? Which countries are eligible for entry? Don’t forget to also abide by Instagram’s Promotion Guidelines, because a contest that gets the boot won’t exactly help your ‘gram. Time to blast your contest all over the internet! Announce it in your Instagram Stories, publish it on your website in a blog post, and create posts for your Facebook page, LinkedIn, online dating profile — whatever it takes to get those entries! After the contest comes to an end, it’s time to select and announce the winner! If it’s a caption contest, choose your favorite. If it’s a comment or tag-to-enter contest, use this website to generate a winner. Create a new post announcing the winner and don’t forget to thank everyone for entering! Congrats — you’re well on your way to reaping the benefits of running a successful Instagram contest. Have you ever hosted an Instagram contest before? Have you ever won one? Tell me below! Let’s keep the flame going and continue to grow your Instagram. Want to learn even more sustainable ways to ignite your Instagram account? Join my free masterclass where I’m spilling all of the best kept secrets on how to use Instagram properly and successfully for your business in 2019.